Create a new Sankey instance. ax axes onto which the data should be plotted If ax isn’t provided, new axes will be created. scale scaling factor for the flows scale sizes the width of the paths in order to maintain proper layout. The same scale is applied to all subdiagrams. The value should be chosen such that the product of the scale and the sum of the inputs is approximately 1.0 (and the product of the scale and the sum of the outputs is approximately -1.0). unit string representing the physical unit associated with the flow quantities If unit is None, then none of the quantities are labeled. tolerance acceptable maximum of the magnitude of the sum of flows The magnitude of the sum of connected flows cannot be greater than tolerance. The optional arguments listed above are applied to all subdiagrams so that there is consistent alignment and formatting. If Sankey is instantiated with any keyword arguments other than those explicitly listed above (**kwargs), they will be passed to add(), which will create the first subdiagram. Add a simple Sankey diagram with flows at the same hierarchical level. Return value is the instance of Sankey. patchlabel label to be placed at the center of the diagram Note: label (not patchlabel) will be passed to the patch through **kwargs and can be used to create an entry in the legend. 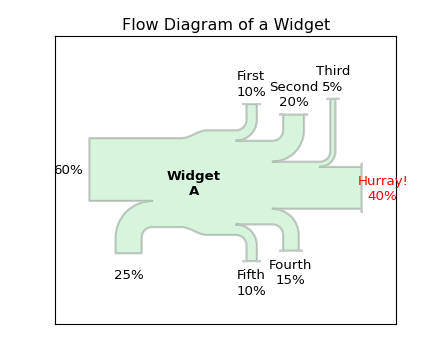 flows array of flow values By convention, inputs are positive and outputs are negative. orientations list of orientations of the paths Valid values are 1 (from/to the top), 0 (from/to the left or right), or -1 (from/to the bottom). 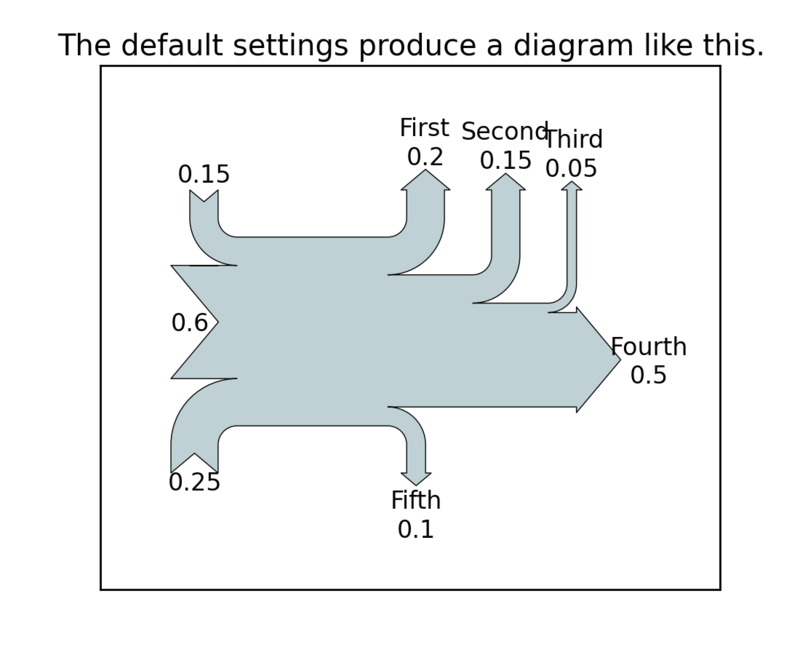 If orientations == 0, inputs will break in from the left and outputs will break away to the right. labels list of specifications of the labels for the flows Each value may be None (no labels), ‘’ (just label the quantities), or a labeling string. 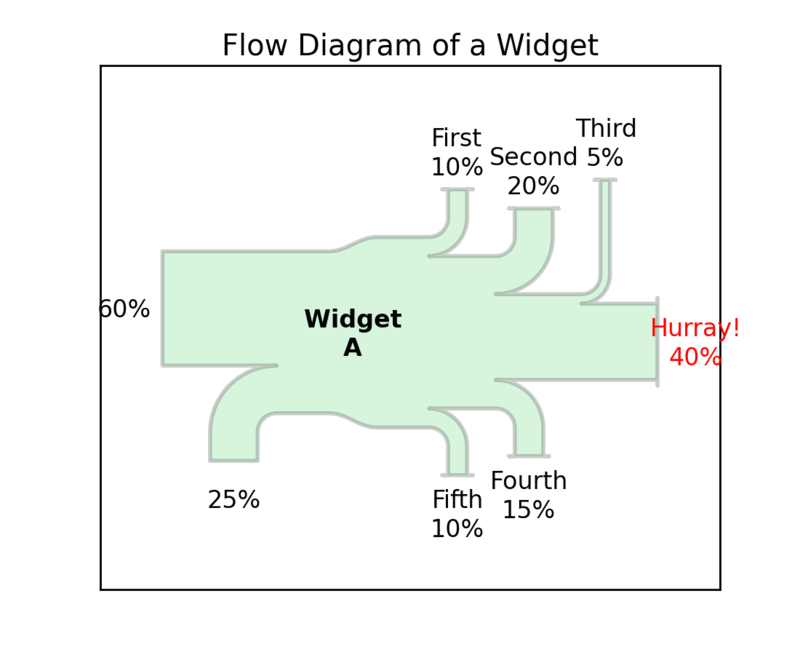 If a single value is provided, it will be applied to all flows. If an entry is a non-empty string, then the quantity for the corresponding flow will be shown below the string. However, if the unit of the main diagram is None, then quantities are never shown, regardless of the value of this argument. pathlengths list of lengths of the arrows before break-in or after break-away If a single value is given, then it will be applied to the first (inside) paths on the top and bottom, and the length of all other arrows will be justified accordingly. The pathlengths are not applied to the horizontal inputs and outputs. connect a (prior, this) tuple indexing the flow of the prior diagram and the flow of this diagram which should be connected If this is the first diagram or prior is None, connect will be ignored. rotation angle of rotation of the diagram [deg] rotation is ignored if this diagram is connected to an existing one (using prior and connect). The interpretation of the orientations argument will be rotated accordingly (e.g., if rotation == 90, an orientations entry of 1 means to/from the left). label string or anything printable with ‘%s’ conversion. As examples, fill=False and label='A legend entry'. By default, facecolor='#bfd1d4' (light blue) and linewidth=0.5. The indexing parameters (prior and connect) are zero-based. 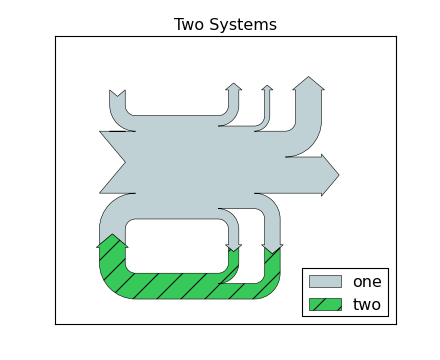 The flows are placed along the top of the diagram from the inside out in order of their index within the flows list or array. They are placed along the sides of the diagram from the top down and along the bottom from the outside in. 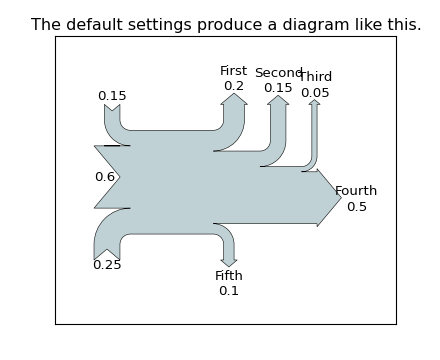 If the the sum of the inputs and outputs is nonzero, the discrepancy will appear as a cubic Bezier curve along the top and bottom edges of the trunk. Adjust the axes and return a list of information about the Sankey subdiagram(s). angles list of angles of the arrows [deg/90] For example, if the diagram has not been rotated, an input to the top side will have an angle of 3 (DOWN), and an output from the top side will have an angle of 1 (UP). If a flow has been skipped (because its magnitude is less than tolerance), then its angle will be None. 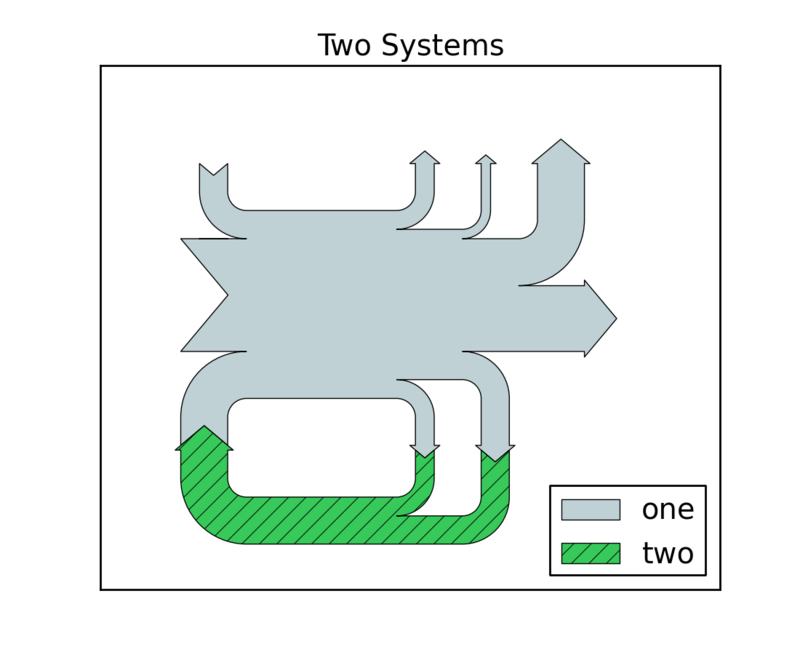 tips array in which each row is an [x, y] pair indicating the positions of the tips (or “dips”) of the flow paths If the magnitude of a flow is less the tolerance for the instance of Sankey, the flow is skipped and its tip will be at the center of the diagram.